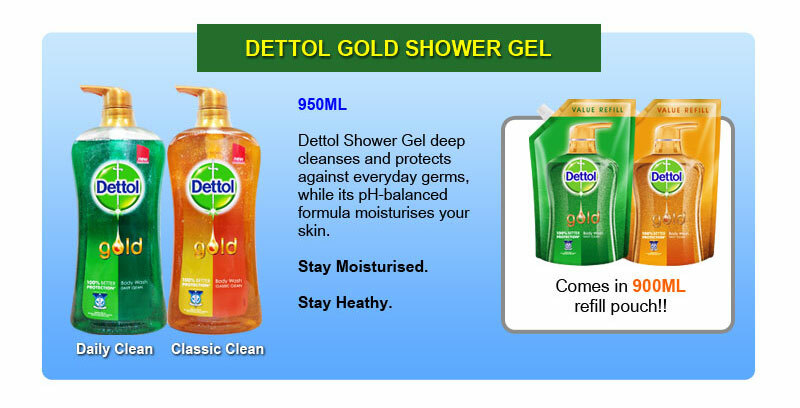 Dettol Gold™ Body Wash is Dettol’s gold standard of germ protection. Unlike other anti-bacterial body wash, the formula offers 100% better protection* from germs. *vs. other antibacterial body wash as tested against indicator organism Product Cautions: For external use only. Keep out of the reach of children unless under adult supervision. Avoid direct contact with eyes. In case of contact with eyes, rinse immediately with plenty of water. If persistent irritation occurs, get medical attention. Store in a cool and dry place. Parfum contains Butylphenyl Methylpropional, Citral, Citronellol Coumarin and Hexyl Cinnamal. Direction of use: For the best lather, place a small amount of body wash onto a shower puff or your palm, and massage onto body then rinse with water. If the defect in the Merchandise was caused by factors other than manufacturing defects within our control (e.g., during the course of delivery), we will not provide you with a refund but we will exchange the defective Merchandise with a new Merchandise. Damaged by abuse or negligence, exposure to chemicals, caustic substances, open flame, high heat, sharp object, usage not within manufacturer’s or supplier’s guidelines.